Kia Forum > KIA Models > Kia Sportage Forum > 4G 2016-2018+ Sportage > Where do you put your phone? Just wondering. Picked up a 19 LX for my wife, and since her iPhone 7+ has to be plugged in for CarPlay to function (versus via BT, really Kia? 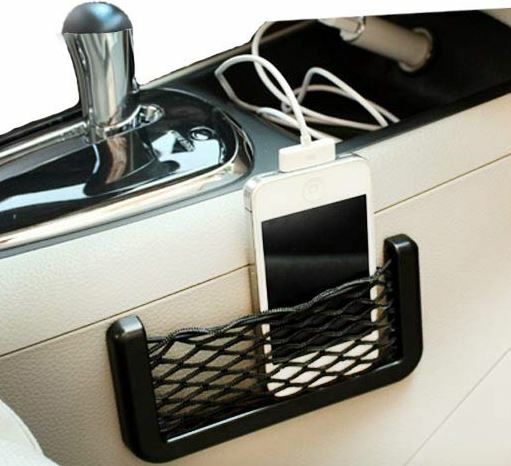 ), where do you put your phone? Seems like the area under the heated seat controls is almost too small for her phone to fit into. She doesn't want to put it in the drink holder (glasses on one side, drink in the other), so I'm just looking for alternatives. I was planning on checking Amazon for some kind of elastic net-thingy that can be attached to the side of the console, that she could slide it into after she hooks up the cable. The solution has to be simple or else she won't use it, something like the picture. What say/use you? Last edited by OldBlue; 01-02-2019 at 08:38 AM. Your idea looks fine. I'm usually alone so I have a tray organizer on the passenger seat. Before I retired I always had my briefcase on the passenger seat and just got used to it. I don't like putting it in a place where it can bounce around. ProClip is the answer. If she uses CarPlay, then the console one would be my choice and the one I use. ProClip is not cheap, but it works like a charm. I had a ProClip in my GTi and I liked it, and I looked at that for her Sportage, but it's got to be super simple or she won't use it, that's why I'm thinking of just a pocket to drop it into after she hooks it up. Thanks for the replies so far. The problem w/ the ProClip is with the case on her phone, it won't fit. Nothing about her ability at all. Proclip does make an adjustable phone holder intended for use with phones that have cases on them. I have no personal experience with proclip products, but after visiting their web site and using the configurator they have, it presented me with that as an option. I put my phone in my pocket since I keep it turned off while driving. Thank you, I missed that. I will look again. Kinda negates the usability of CarPlay for navigation? ProClip has adjustable holders for phones with cases. They are even deep enough to hold phones with double batteries. These are not the cheap spring loaded ones which are a pain, IMO. You simply adjust it once with a screwdriver, and it fits your phone perfectly.